Homemade valentines might bring doilies and glue sticks to mind, but this classy upgrade is almost as easy as the elementary school version. Chocolate truffles are essentially ganache nuggets dusted with cocoa powder. Ganache is incredibly easy to make and dangerous to have in the fridge. This recipe makes a dozen (good sized) truffles, but you might want to double it in case you find yourself “testing” that ganache more than a few times as it cools. 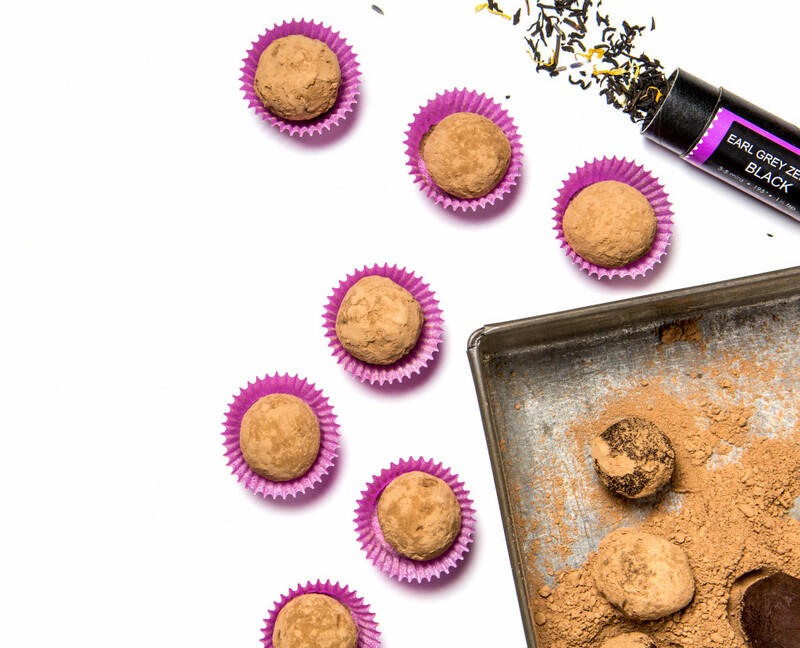 We used just enough of our Earl Grey Zephyr loose leaf tea, featuring real oil of bergamot, orange peel, and lavender, to subtly flavor the chocolate. Use more tea to further emphasize the flavor, or try it with our Lady Earl White or Royal Earl Grey Chai. Bring cream and butter to a boil in a saucepan and remove from heat. Stir in tea leaves and let steep 5 minutes. While the tea is steeping, finely grind chocolate in a food processor and transfer to a bowl. Pour the cream mixture through a fine-mesh sieve onto the chocolate, discarding the tea leaves. Whisk until smooth. Cover and chill in the refrigerator at least 2 hours. To shape the truffles, spoon even scoops of ganache onto a baking sheet. A melon baller or ice cream scoop can help create rounded, even scoops. Make sure your hands are cold (running them under cold water or holding a piece of ice first helps). Dry and roll each piece of ganache into a ball. Keep the rolling to a minimum to prevent the chocolate from softening. They don’t have to be perfectly round; after all, they’re homemade! Drop several balls at a time into bowl of cocoa powder and turn to coat. Transfer to an airtight container, separating layers with wax paper. Store for up to two weeks in the fridge, dusting lightly with more cocoa before serving if needed. This entry was posted on Wednesday, February 10th, 2016 at 11:33 am	and is filed under Uncategorized. You can follow any responses to this entry through the RSS 2.0 feed. You can skip to the end and leave a response. Pinging is currently not allowed.